A car’s transmission converts the power released by its engine to the vehicle’s wheels. The transmission consists of gears, a bell housing and filter. Transmission fluid is used to lubricate these parts. It cools the transmission and helps transfer the engine’s power to the transmission. You must check your transmission fluid twice a year or more often to prevent damage to the transmission and keep your car shifting properly. If you are having trouble shifting gears or your vehicle surges or stalls after being put in gear, you may need to get a transmission flush. A transmission flush is performed by an auto mechanic to clean a transmission of old fluid and pump in new fluid. It removes debris from the cooler, cooler lines and converters. A mechanic attaches a special machine to your car’s pump intake. After the flush, your mechanic will look in the pan for bits of metal and other problems and replace the transmission filter. As the flush progresses, fresh fluid enters the pump intake and old fluid is dropped into a tray. When this type of transmission flush is over, the mechanic replaces the pan and installs a new filter. The transmission now has new fluid, with any dirty fluid dumped in the collection tray. A transmission flush is more complicated than a fluid drain. When performing a fluid drain, your mechanic will remove a drain plug from the transmission and let used fluid drip into the pan. While this procedure removes most of the old fluid, it doesn’t thoroughly clean the transmission. It is less expensive than a flush and there’s little potential for damage to your transmission. 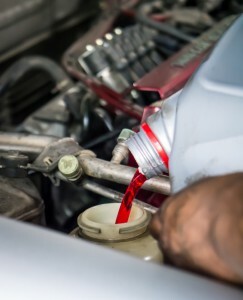 Some old fluid may remain in the transmission and combine with the replacement fluid, making it less effective.